Ocean Country is a memoir about belonging, longing, and awakening. It’s one woman’s journey from loving the beauty of the ocean and all its life forms to realizing that all the oceans are diseased, abused and in peril – unless we commit to doing something about it. 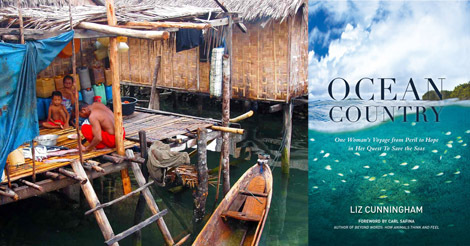 Liz Cunningham http://lizcunningham.net/ocean_country_the_book/ takes us through her own grief at the imminent loss of this beauty, and the research she explores in an effort to save not only the beauty, but also the ocean’s role as a crucial life-support system. In her research, she discovers that 50% of the oxygen we breathe comes from the photosynthesis (conversion of sunlight into chlorophyll, which is green) of marine plants and algae. She makes this more personal by rewording it: every other breath we take depends on the health of these plants and algae. How much of Earth is water? 70%. How much of Earth’s water is salty ocean? 97%. 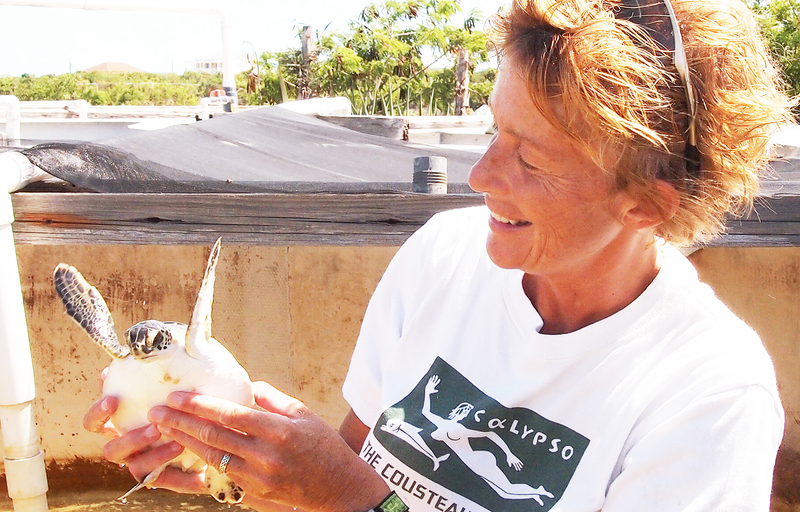 Cunningham’s first awakening happens in the Turks and Caicos Islands (TCI). She’d been recovering from injuries from a kayak accident and struggling with Hashimoto’s disease, longing to return to go diving on the coral reefs in the TCI, and finally finds the energy and courage. The beauty overwhelms her: “My whole body was smiling. Diving opened up so many unexpected worlds for me, not just the ocean, but also my own body and how my breath was connected to the world as a whole.” She learns from a marine biologist that coral is a colony of millions of vibrant animals. “Not plants. Animals. Each has tentacles, a mouth, and a stomach; each spawns and propagates.” She tells us that corals sense the full moon and sunset and emit a chemical that allows them to smell each other during spawning, that they mate and propagate, growing in colonies that form the limestone reef armatures that are essential to ocean life. A week later, shock. Cunningham returns to dive on this same reef, expecting to once again be stunned by the variety of multicolored fishes, sea fans and corals. Now the miles and miles of it are barren of life, and the coral is “bleached” – white, not mesmerizing shades of pink, purple, orange, red, yellow. She feels as if she is swimming “through the ashen remnants of a bombed-out cathedral.” She knows the reef is fighting a terminal illness. The investigative reporter in her asks questions (a running theme in Ocean Country). “What don’t I know? What do I need to know?” She learns that there had been a four-degree spike in the off-shore water temperature, from 78 degrees up to 82 degrees Fahrenheit. That month of June, 2012, she learns, had the warmest surface temperatures ever – of both land and sea – in the Northern hemisphere. Realizing the need to explore the ocean in other parts of the world to understand the destruction that is occurring, and also to preserve the life of the seas, Cunningham travels to the Californian Coast, the Mediterranean, and the Coral Triangle – the Indonesian-Philippines bioregion. Everywhere she goes this question directs her quest: how can we live without leaving a trail of destruction behind us? And a new one from all she has learned: If we really do share an interconnected destiny with other creatures, how do our lives need to change? Liz Cunningham’s search for answers concludes after swimming with a mother humpback whale, whose eye, big as an apple, looks at her with calm, care, and confidence. The mother’s calf wobbles close by. Whales have their songs. If Cunningham could give us just one song, she writes as her final word to us, it would be this: Find someone or something to save. Be specific. Now’s the time. As I write those words of hers, hear them repeated to myself in my own voice, they reverberate in my soul. I notice my heart is beating faster. It’s urgent. And it’s a love story. Lovely but sad. Tragic and enraging that man has had such a detrimental effect on so many of the other species that share the planet with us. Renata, you are so right – it is sad. Liz Cunningham has turned sadness into action and with more people like her we can turn this around. So sad and so lovely Dee. Must get a copy of her book and keep listening to you. How to join Rashmi into your blog? Thanks Pat. I really appreciate your comment. Diane: that’s a fabulous review of what sounds like a terrific book. Cynthia, thank you so much. You can borrow my copy! A great message. I’m trying, but the terrifying thing is there are so many things that need saving. Yes, so many! Looking back at one of your blogs, I’d say your work/play in classrooms has helped save a sense of curiosity and achievement in children. Thanks for that wonderful comment, Marguerite. And I know it’s a theme close to your heart. your site is so full, rich!